Nothing says home like personal touches. 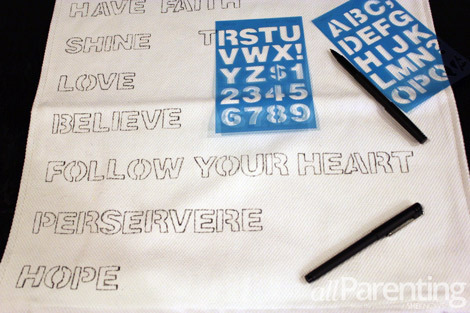 With a fabric marker, a pillow and stencils, you can whip up personalized throw pillows to add warmth to your living space, or create great gifts with meaningful messages! Throw pillows can make a room. They set your color palate, create texture or add a pop of pattern to a solid sofa. 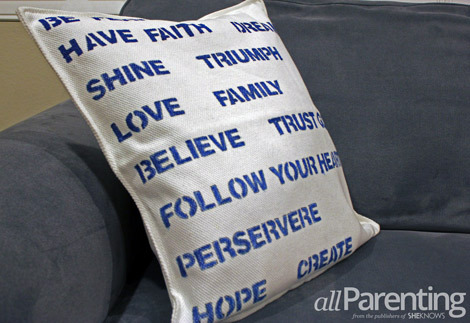 With a little creativity and a few supplies, a throw pillow can also reflect something very personal — like your family rules, inspiring notes for your children, or phrases from your favorite books or songs. This how-to, adapted from a fabric marker tutorial on Wit and Whistle, will help you make a fab personalized pillow that you can use in your own home or share as a thoughtful gift. All you need is a throw pillow or pillow stuffing, a pillow cover, a fabric marker (Michaels, $6), cardboard and an alphabet stencil set (Amazon, $4). Fabric markers and pillow covers come in endless shades, so pick a combo that suits you. If you want to make sure the words are center stage, consider dark ink on a neutral pillow. After you've washed your pillow case, start by laying out your pillow cover on a flat surface. Insert cardboard into the pillow cover — without the pillow or stuffing — so you can write without the fabric marker bleeding to the other side. 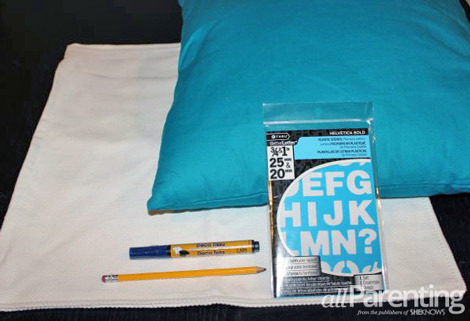 Once you know the words or phrases you want to use, stencil them on the pillow with pencil first. Then, stencil over with the fabric marker to make it permanent. Test to make sure the design is dry, then flip the case over to the other side and repeat. 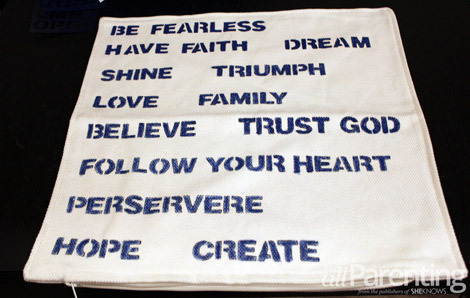 Once your stenciled words are dry, stuff the pillow cover with pillow stuffing, or with a throw pillow that fits inside the cover. Since I happen to have a stuffing phobia — and little ones at home that wouldn't hesitate to unzip the case and pull out the fluff — I used a square throw pillow (Ikea, $2) and a case (Ikea, $6) that fit it perfectly. Plus, an already-made throw pillow can stand up to living room pillow fights and can easily be used again on its own or in another case.